Hymns, Spirituals and Sacred Songs by Happy Traum teaches beautiful songs of faith taken from the folk, gospel and blues traditions and specifically arranged for beginning and intermediate guitarists. The pieces start at an easy level and gradually advance in difficulty, so that by the end of the lesson, even a relative novice will be able to play some fairly challenging material. Video One is 80 minutes long and contains "Amazing Grace," "My Lord What A Morning," "Let Us Break Bread Together," "Angel Band," and Happy's inspiring version of the Bob Dylan hit "I Shall Be Released." Video Two is 70 minutes long and continues with four beautiful songs taken from the gospel/blues traditions. You'll learn a variety of guitar techniques including complete instrumental solos for "Paul And Silas (All Night Long)," the classic "12 Gates To The City," "Just A Closer Walk With Thee," and "Bright Morning Stars." Set includes 2 DVDs and accompanying song booklets in standard notation and tab. 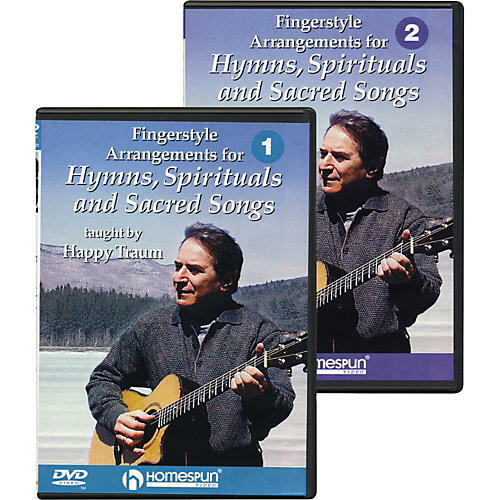 Order Hymns, Spirituals and Sacred Songs and learn traditional songs of faith in the fingerpicking style.